Here is what you do. You take a slice of rye bread and cut out the crumb. Heat up the pan and melt the butter. Place the bread slice on the pan and let it stay there for 30 secs. Then carefully break the egg and pour it inside the bread slice. Add some salt and pepper and cover the pan up with the top. Leave it on for 3 to 5 min. You may serve is with some fresh greens, such as onions or chopped parsley greens. 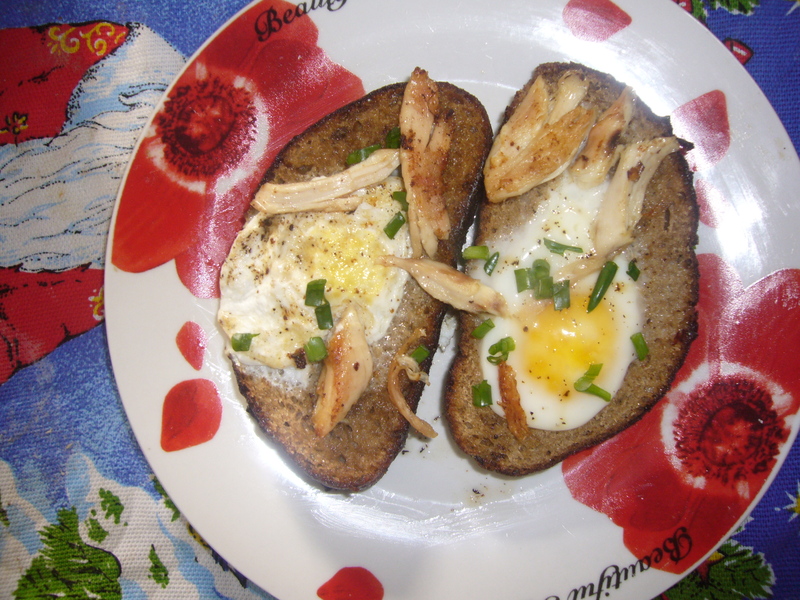 This entry was posted in Easy Recipes and tagged breakfast, breakfast recipe, cooking, easy breadfast, easy recipe, eggs, eggs in bread, food, recipe. Bookmark the permalink. Looks good…did you add chicken to that too? Yes, I did. Had some cold baked chicken left from the day before. You can add any meant or bacon. Oh we love eggy bread too! It’s a great breakfast.